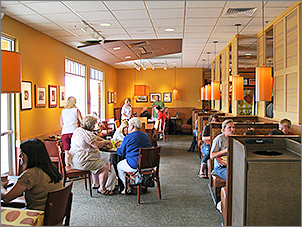 Panera Bread has grown as a Baked Goods Company over the years. They offer breads, muffins, bagels and other bakery items all day. My son and I decided to treat ourselves to lunch, and seeing the great coupon in the Sunday paper, decided to stop by Panera for a bite to eat. We decided to each order our own "You-Pick-Two" specials. I went with the French Onion Soup & Chicken Salad Sandwich. My son picked the Salmon Club Sandwich & Cheddar Broccoli Soup. All the soups and sandwiches are homemade style, and were delicious. The soups were creamy and flavorful, and the sandwiches were on some awesome bakery bread. The restaurant has a hip, eclectic feel, very clean and airy. There is a small outdoor seating area for when the weather is nice. The servers were very polite and cheerful, and our food was ready in minutes. This seems like a great place to enjoy soup, salads, sandwiches, and various bakery desserts. Their quickness makes it a great lunchtime stop. For lunch I went to Panera's which is located in Ashwaubenon on the west border of Green Bay. The interior of the restaurant is bright with large picture windows on one whole side and front with soothing colors of orange, gold, and pumpkin. It is very spacious with a large seating capacity that extends deeply to the back. In the back of the restaurant is where you get your own beverages, ice, and condiments. I noticed towards the front of the restaurant there is a gas fireplace for use when the weather gets cold which looks like it would be cozy in those winter months. They have a nice selection of items on their menu ranging from a variety of salads, soups, sandwiches, and specialty drinks. The great thing at Panera's is that they make all their own Artisan breads from a starter scratch right on the premises and they also carry organic yogurt, juices, milk and antibiotic-free chicken. You order and pay at the register and when your food is ready they call you by your first name. I ordered their Asian Sesame Chicken salad for $6.89 which includes a piece of their French bread and a Grande freshly brewed black iced tea for $1.75. My salad consisted of all natural, antibiotic-free chicken, romaine lettuce, fresh cilantro, sliced almonds, sesame seeds, crispy wonton strips, and reduced-sugar Asian sesame vinaigrette. The salad was large and fresh; it did not have any color to it but it tasted scrumptious. There was a good amount of each ingredient especially the chicken and the dressing was mixed very thoroughly on the salad not soggy or too light, just right. The dressing was very good; it was light with a slightly pungent flavor. The piece of French bread was delicious, very fresh with a crispy crust. My iced tea was also tasty and a nice dark brew. Panera is a great place for a quick and fresh meal. Next time I go back to Panera I will definitely buy some of their specialty breads to go.